According to tradition, the Jewish community in Uzbekistan was established more than 2,000 years ago after the destruction of the First Jewish Temple. Today, the Jewish community of Uzbekistan numbers approximately 4,200 people. According to tradition, the oldest of Uzbekistan's Jewish communities, that in Bukhara, was founded from the exile of Eretz Israel following the Babylonian destruction of the First Temple. Other accounts tell of Jews fleeing Persian persecution more than 1,500 years ago and yet others bring Jews to Uzbekistan as merchants on the Silk Road in the seventh century. By any account, Jews in Uzbekistan have a long history. Most were artisans and merchants since land ownership was forbidden. And, like most other Uzbeks, they rode out the tumultuous history of the region, marked by invasions by Alexander the Great, Genghis Khan, the Sardians, the Qarakhanids, the Seljuks, the Persians, the Turks,and the Chinese, all who ravaged Central Asia. Jews in Uzbekistan faced great hardship under these regimes with two exceptions: Tamerlane and the Russians until 1917. Under Tamerlane's 14th century rule, Jewish weavers and dyers contributed greatly to his effort to rebuild to region and reinstitute the abandoned Silk Road. In that period, Bukharan Jews also made nearby Samarkand, the city Tamerlane adorned as his capitol, a major Jewish center. After Tamerlane's death, however, Jews again endured harsh treatment by the region's various rulers. Strict Muslim authorities enacted humiliating and restrictive rules forbidding Jews from living outside the Jewish quarter, Jewish gates and shops had to be built lower than those of the Muslims. Jews had to wear a black cap and a cord belt, and accounts by Jewish witnesses in court were not valid for Muslims. The 1868 Russian invasion eased restrictions for Jews who flourished until the 1917 revolution. Jews finally enjoyed Judicial equality with Muslims as well gaining rights which the Russian government withheld from Eastern European Jews, such as the free acquisition of real estate. An estimated 50,000 Jews lived Samarkand and 20,000 in Bukhara during this period, including men such as Potelyahov, Davydov and Pinkhasov, whose riches were shrouded in legends. In those times they were called Oligarchs, because they controlled most of cotton supply in Russia and they owned dozens of factories and shops, large tracts of land and railroad. The Russian Revolution in 1917 changed everything, abandoning free-enterprise and forbidding religion. In 1917, there were 30 synagogues in Samarkand, by 1935 just one. Nonetheless, underground movements and a deep commitment to Judaism that had helped Jews maintain their identity for thousands of years once again set in to get Jews through Communism. The 1970 Soviet census showed 103,000 Jews in Uzbekistan. Ashkenazi Jews are relatively new to the region, hardly any lived in Central Asia until Stalin sent thousands of Russian Jews to Uzbekistan as punishment. More than one million Holocaust fleeing Jews passed through Uzbekistan, with about 200,000 remaining after World War II. Approximately 4,200 Jews remain in Uzbekistan, mainly in Bukhara, Samarkand and Tashkent, the major Jewish cultural centers. The Jewish Agency, Chabad and the Joint Distribution Committee are the most visible Jewish organizations in the country, providing Jewish education through schools and summer camps. The Jewish Agency sponsors a moadon (youth center) in several cities, including Tashkent, Samarkand, Bukhara and some smaller cities in the Fergana Valley, like Andijan. In July 2001, more than 250 children attended the Jewish Agency's summer seminar on the outskirts of the capital, Tashkent, a 10-day lesson on Israel and Judaism. The campers, ages 10-16, came from all over Uzbekistan (which is slightly larger than California). And while their knowledge of Jewish topics ranged widely, they all shared a Jewish identity, singing Hebrew songs, baking challot and drawing pictures of the Kotel. Some even spoke Hebrew, others kept kosher and rested on Shabbat. Most Uzbek Jews today speak Russian. Historically, they spoke a Jewish dialect of Tajik which is still spoken in Bukhara and Samarkand. In addition, some speak English, Hebrew and Uzbek. Unfortunately, among adults, there is little mixing between Ashkenazim and Bukharim. 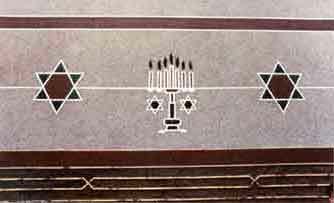 About 2,000 Jews live in Samarkand today and there are two synagogues. The exterior of the lone active synagogue in the Machalla, the old Jewish quarter, is currently under construction, but its friendly caretaker will invite you inside the courtyard and into the main hall, speaking in an interesting, but understandable dialect of Hebrew. Services are still held here Friday nights, although there is not always a minyan. The interior of the synagogue, which dates back at least 80 years, perhaps more, no one knows for sure, is beautiful. 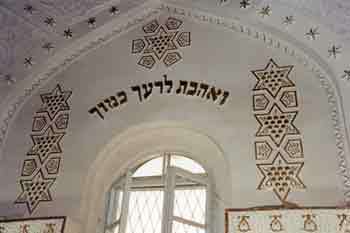 The bima, carved with Stars of David, is in the middle of room, Sephardi style, underneath a 40 foot dome. Fold-out wooden chairs line the walls. An estimated 100-150 Jews make up the current community in Bukhara. Although 88% of Uzbekistan's 24.7 million people are Muslim, religion and politics have been kept separate, preventing the type of violence seen in the Middle East. Good relations between Israel and Uzbekistan probably account for the real reason since the government is authoritarian and would crack down on any non-government sanctioned action against Jews. The real threats to power in Uzbekistan are by Muslim fundamentalists originating in neighboring Tajikistan and Afghanistan. Several terrorist attacks, in the form of car bombs, have rocked Tashkent in recent years. Through the Jewish Agency and other organizations, Uzbek Jews have been leaving at a steady rate (more than 70,000) since Uzbekistan gained its independence in 1991. Most head to Israel and the United States; there is a sizeable Bukharian population in Jerusalem, but the largest expatriot population of Bukharian Jews exists in Queens, New York. Approximately 35,000 Bukharian Jews live there. Life in Uzbekistan is among the most difficult in the world. Recent inflation ravaged the economy; the average person makes $10-15 per month. Unemployment is high and government corruption scares away foreign investment, all of contributes to a bleak outlook for Uzbeks–Jew or gentile. Israel is also providing various forms of aid to Uzbekistan. In a project started in 2001, Israel gave more than 100 drip irrigation systems to farmers of the Kungrad and Muynak regions of Karakalpakstan, which resulted in a ten-fold cut in water use and led to a 300-400% increase in vegetable yields. Farmers also received seeds of paprika, tomato, cucumber, and aubergine. On July 30, 2004, a suicide bomber attacked the U.S. and Israeli embassies in Tashkent. One Uzbek guard was killed in the attack on the Israeli embassy; the embassy staff was unhurt.